Corona, CA - Racing a Monster Energy/Pro Circuit/Kawasaki bike isn't something everyone can do but you can make your KX250 or KX450 look just like the race machines. 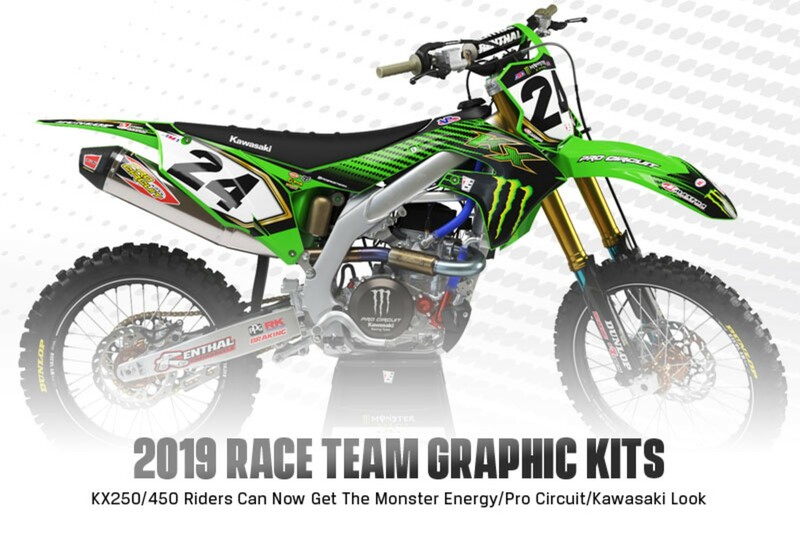 Available now from Pro Circuit are the 2019Monster Energy/Pro Circuit/Kawasaki Team Graphic Kits to fit the 2017-2019 KX250 and 2019 KX450. Each kit is printed by Throttle Syndicate and includes high-quality digitally printed graphic decals for front and rear fenders, front fender curved decals, shroud decals, fork guard decals, swingarm decals, and extra sponsor decals for fenders and tank. Number plate backgrounds and seat cover are available separately through Throttle Syndicate. Note: Gold hologram elements seen on team bikes are not featured in the sale kits. Race report, results, and championship standings for the 2019 Anaheim Two Supercross, round three of the 2019 Monster Energy Supercross Series.